What is it with making homemade candy bars? I think in my mind I’m sort of turning the house into a chocolate factory every time. I am Willy Wonka but without the Oompa-Loompas or a psychedelic boat or an elevator that goes sideways or really any elevator, I guess. Okay, I’m not Willy Wonka. Well, at any rate. I had a lot of fun making my own Twix bars. So, I thought next I’d give Kit Kat bars a try. These ended up being even easier to make than the Twix bars! You only need two ingredients. Yep, that’s not a typo—only two ingredients. Melt the chocolate. The easiest way to do this is in the microwave. Simply place the chocolate chips in a microwave safe bowl, microwave on high for 30 seconds, remove and give it stir. Repeat until the chocolate is melted. If you find that your chocolate is too thick and therefore difficult to work stir 1-2 teaspoons of oil into the chocolate (vegetable, canola or peanut oil work well since they don’t have a strong flavor). Melt the chocolate. The easiest way to do this is in the microwave. Simply place the chocolate chips in a microwave safe bowl, microwave on high for 30 seconds, remove and give it stir. Repeat until the chocolate is melted. If you find that your chocolate is too thick and therefore difficult to work stir 1-2 teaspoons of oil into the chocolate (vegetable, canola or peanut oil work well since they don't have a strong flavor). Dip a wafer cooking in the melted chocolate, place on wax paper. Dip another cookie and place it right next to the first, so the chocolate in between the cookies blends together. I made my Kit Kat bars out of three wafer cookies each. Repeat until you've coated them all. Allow the chocolate to set before eating. Oh, man. The green tea Kit-Kats are one of my absolute favorite candies. We’ve found them in a few Japanese markets (both in San Francisco and in Austin), but they sell out so quickly! We’ve also seen (but not yet purchased) them on Amazon. So, it could be a good backup plan if you can’t find them anywhere near you. Can I say that I’m staring at the mirror?!? I didn’t even know there was a green tea flavour of Kit Kat. How strange. But I love these homemade ones; Kit Kats are my fave, I’ve just never thought about making my own – so cool! Yum Yum Yum, these look amazing!!! This is absolutely brilliant, I really love the pink ones! These are one of the few treats I know how to make already! Still, though, it never hurts to gaze upon some lovely pictures of them! Well that’s super easy, isn’t it? Are you going to continue makes homemade versions of candy bars, because I’m all for that. Excelent idea! I’ll do this with some chocolate decorations for valentine’s day! After reading the title I had to look at this post! You made them by yourself?? Wow – what a great idea! First homemade heart-shaped donuts and now homemade Kit Kat bars?! Yall know the way to my heart! Will be making these at the weekend…and eating them all myself!! These look really yummy, I’m quite tempted to try my hand at trying it although me and the kitchen rarely get along. But they do look super easy to make so I might succeed, I hope? Ohhhhhh. My My. LOVE 🙂 pinning & sharing on FB! These could become a favorite of mine! Thanks for the clever recipe! These look great and are easy enough for the kids to do. Think we’ll do these this week. Thanks! Kit Kats are my absolute favorite candy!!! i have to try this recipe out! These are brilliant and super easy to make! Definitely pinning this on my Pinterest. You can make green tea Kit Kat’s with matcha powder! I think you could simply mix matcha powder into your batch of white chocolate and voila! I’ve made matcha mochi and cupcakes by mixing the powder into my recipes. It’s powerful stuff though, so a recipe doesn’t need much. Caffeine! Wowzers, your ideas always floor me! Mmm Kit Kat is a huge favourite! They had the green tea-one in Japan when I was there but I never tried it. These ones I definitely will though! A few years back when I lived in London for a month they had Kit Kat Chunky Limited Edition, there was one orange-flavoured that I just loved! Still crave it sometimes, 9 years later. Such a great recipe! Love the colors and flavors! Kit Kats are my weakness….woofta. This is so clever. I love how you were able to make that soft pink hue! I follow you from South Italy and I think you’re lovely girls with a lot of Amazing ideas. Your post are very interesting and inspire me,I try to follow your suggestion because It’s a way to bring me in USA (just virtual way unfortunatly). Candy making is the best for getting little kids into the kitchen. They can’t use knives or control the oven, but they can dip and spread melted chocolate. It’s safe and of course they love the treats afterward. These look amazing! Have you had the passion fruit kit kat bars? So good! There is a store in Ohio called Jungle Jim’s that sells all kinds of stuff like that, I think that they also had the green tea ones. Ooooh how fun. I must try these at home! For green tea kit kats, I think the easiest to do to replicate the flavor is to add matcha (green tea) powder to white chocolate; you’ll also get the most similar color that way. In areas where Asian grocery markets aren’t very prevalent, you can occasionally find Japanese flavored (many, many different flavors… from pumpkin to wasabi!!) Kit Kats at Cost Plus World Market. GREEN TEA IS JUST THE BEGINNING! I worked in Tokyo for a few months and got in on the KK madness– different flavors of the candy are sold seasonally and regionally. Regular, white choc, green tea, cherry, strawberry, blueberry, soy sauce (yum! ), yam, lemon, wasabi, edamame and so many more. They make them in sweet and savory flavors. There’s even natto… which is def an acquired taste. You can buy many of the popular flavors such as matcha and blueberry at Japanese markets in the US– but they’re also available on Amazon. Thanks for this brilliant, simple solution. Those wafer cookies are my fav! 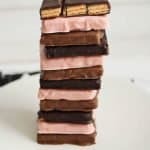 Pink kit kats HAVE to happen in my kitchen!! Thanks! I didn’t even know this was possible but I will definitely be trying it! you have got to be kidding! these are amazing!! My heart just stopped. These look amazingly delicious!!!!!! Really?! I’m jealous. I’ll have to look next time I’m in CA. Maybe… why, do you have a request? I’m sort of thinking about trying york peppermint patties next. We eat those (frozen) at our house a lot. If you want to make green tea ones next time try adding a small amount of matcha to the white chocolate before you dip them :). It will taste a lot like the green tea kit kats! Mmm… Kitkats! So easy, but I’d never thought of it! Thank you for sharing! Southern Italy? How cool! I would just LOVE to visit your country one day. Soy sauce flavored kit kats?????? You just blew my mind. those pink bars look great! Kit Kat bars are possibly my favourite candy in the entire world. these are perfect! Omg! I love kit kats and this is a wonderful idea! This is just the greatest idea ever! I have got to make these for my kiddos! Ah, these look dangerous! This week is definitely going to be chocolafied for me and I can’t wait!! Dude! I love kitkats! You guys are gonna make my dentist rich, i can already feel a cavity coming on just by looking at these pictures. Totally worth it though! In Japan, they have tons of crazy kit kay flavors! Such as: green tea, chili pepper, cookies and cream, and grape. I saw green tea flavoured kitkat bars in a big Asian grocery store chain called T&T here in Canada. It’s a Japanese brand so I guess you could find it in any big Asian food store. There was also strawberry flavour. These look delicious! Can’t wait to try and make them. I absolutely LOVED your twix bar recipe! I’m so excited you posted the one for kit kats too…it’s perfect! Thanks so much! You can find the green tea kit kats on amazon for a nice price. Try searching green tea or matcha. They’re also seasonal. If you want to make a trip to Hawaii, they sell them there too. I get mine at a Japanese grocery… They have the cookies & cream, vanilla ice cream, strawberry, raspberry, green tea, etc. Mitsuwa is the national chain. I believe they have one in Chicago. Also, you can find it on eBay for sure. And finally, get the powdered green tea matcha, mix with melted white chocolate, BOOM. I use it all the time for writing and my green tea cheesecake decorations. Man o Man what a good idea! These look AWESOME!!!!!! I might laden mine with peanuts and make them into a snickers type snack! but my cooking is so bad…..
Aww, give these to me! Looking so delicious! These are so adorable – love the tri-color! Probably making these for my office for Valentines Day. Thanks for the recipe! Green tea flavour is my FAVOURITE! My boyfriend has friends in Japan and they just sent us a whole bunch of different flavoured mini kit kats. From black bean sandwich (so strange), to strawberry (yum! ), to spicy (I’m too scared to try it). Most Asian food stores do carry flavoured kit kats and since the green tea isn’t too wild and there is a matcha trend here (in Canada) you can find them pretty easily. Just keep your eyes on the look out for Asian markets and hopefully you’ll get to try it someday soon! My boyfriend LOVES kit kat bars and I may or may not participate in the upcoming Valentine’s day this year just to make him these little guys! Happy Valentine’s Day to me! These truly get me excited. Definitely next up on the diy menu. I can’t believe that I didn’t stumble on this post sooner!! These look amazing – I will have to try and recreate them !!! Sometimes we find Green Tea Kit Kats at Cost Plus World Market (and they also have dark chocolate mint flavor). But the most interesting ones so far were the passion fruit flavored ones we bought at an Asian Market. I would add a picture but I don’t know if I can here. Bought them for my husband for Christmas. Delish! I am living in Japan now, so Green Tea Kit Kats are pretty common here. As are so many other flavors! The seasonal cherry blossom one should be coming out next month! Each area of Japan also has their own flavor of Kit Kat. I have tried soy sauce and wasabi ones too! So excited to try this! I LOVE KitKats and I also love an easy recipe. Thanks Emma! Yum! These look great, definitely one to try with my cousins over half term. I’ve found matcha Kit-Kats at LeeLee International Supermarket for six dollars a bag. They are an awesome grocery store chain in Arizona. There’s one in Tucson, one in Peoria, and one in Phoenix.